Mark and Anna Rose joined Catholic Workers and other activists from across the United States for part of Witness Against Torture’s eight-day Fast for Justice. From January 6-13, the activists stayed at a DC church and engaged in daily activities highlighting the ongoing crimes of torture and indefinite detention at Guantanamo Bay. Below is a press release covering the January 11th actions, which highlighted the anniversary of Guantanamo’s opening. 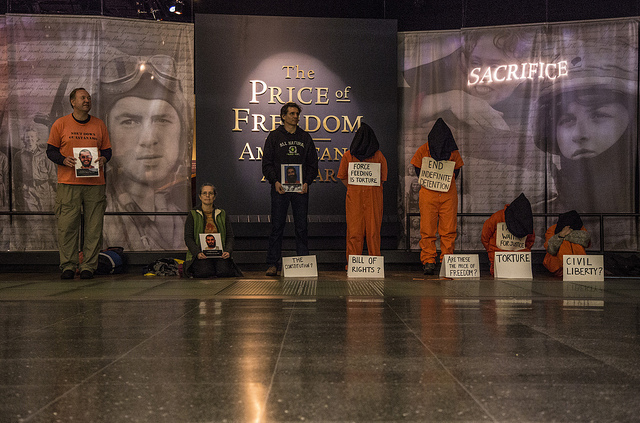 Vowing to “Make Guantanamo History,” human rights advocates from around the country marked the beginning of the thirteenth year of torture and indefinite detention at the prison camp with a dramatic protest at the National Museum of American History. 150 activists occupied the atrium of the crowded museum for more than two hours, speaking out against torture and calling for Guantanamo to close. The museum protest followed a robust and spirited rally at the White House that featured speeches from grassroots activists, Guantanamo attorneys and representatives of national human rights organizations. Since Monday, January 6, Witness Against Torture activists from throughout the country have gathered in Washington, D.C. to engage in street theater, demonstrations, fasting and direct action to demand that Guantanamo be closed immediately. There were also anti-Guantanamo protests and vigils throughout the country, including in Los Angeles, CA, Boston MA, Chicago IL, Santa Monica, CA Erie, PA, and Cleveland, OH.